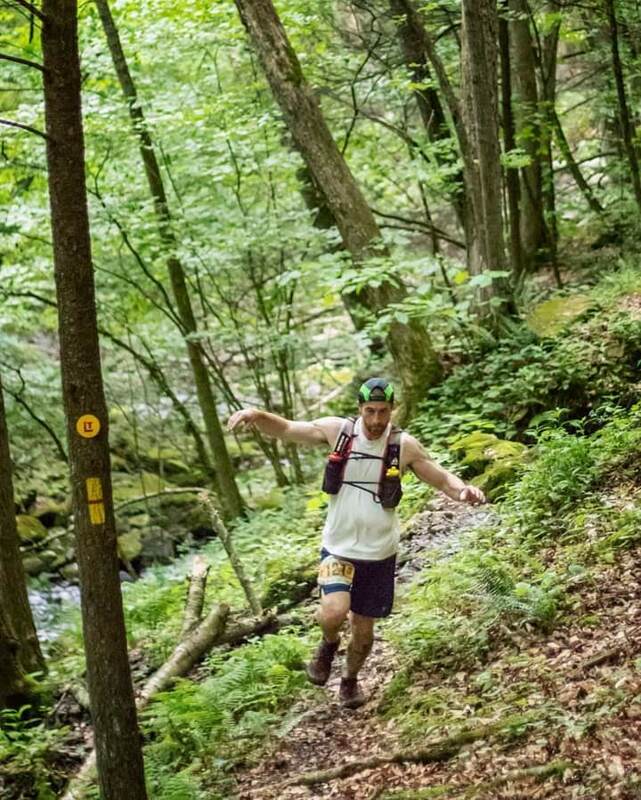 Author’s Note: This race report was written after the announcement that the 2018 Eastern States 100 was cancelled. As a runner who was planning to run the PA Triple Crown Series, this news came as a huge disappointment. I tried to not let the feelings of unfulfilled expectations impact this writing, but some degree of letdown may have bled through in the process. Regardless, I hope you enjoy. Prepping for the 2018 Worlds End 100k was much different than my preparation for it in 2017. My training regimen and fitness level was about the same, but my mental state was vastly different. I went into 2017 extremely confident after a much better than expected performance at Hyner 50k. I underestimated the difficulty of the Worlds End 100k course and overestimated my abilities which resulted in a much longer and less enjoyable day in 2017. This year I knew what I was facing and had a much greater deal of respect for the course and the challenges it would present. 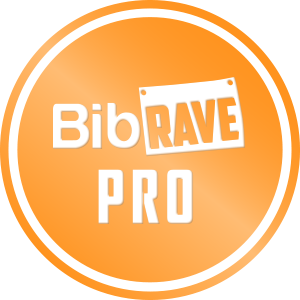 Learning from my experience last year, I made a few changes to the way I ran the course this year hoping to avoid repeating the most negative experiences I had. My actual training was about the same as last year, lots of running trail miles while trying to get as much elevation gain as is possible in South Jersey. Since there’s very little elevation change anywhere in South Jersey, this year I tried to supplement my running regimen with other workouts: lunges, box jumps, and burpees. My hope was that although I’m not getting a ton of elevation gain during runs to build my climbing ability and endurance, the other workouts focused on my legs would prepare them for the long, demanding climbs that nearly destroyed me last year. Last year I was nervously excited leading up to the race and just plain nervous right before the race. This year was different. During the entire training period I was just excited to have another go at Worlds End and to do it better than last year. My goal for the year was to improve my cumulative time for the PA Triple Crown Series. I had set myself up well to meet that goal as I was only five minutes off from my time last year at Hyner and I knew that was the one race with the least room for improvement. I knew that as long as I had a good day my 2018 Worlds End time would be better than last year and likely by more than five minutes. On top of feeling like I was well prepared for this race and on my way to achieving a big goal, I knew a lot of people who would be running Worlds End. 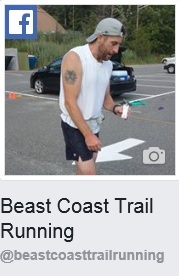 These are other runners I’ve met over the last few years at other races and training runs. I was pretty excited just to have the chance to catch up with all of them at one race since I only see the majority of them a few times a year. I made the sixish hour drive from South Jersey to Worlds End State Park in the PA Wilds on Friday, cursing the Philadelphia traffic just before the midway point of the trip. I grabbed my race packet, chatted with a few folks I hadn’t seen in awhile, and then headed to the same campsite I stayed at last year. Weather forecasts from about a week out had been predicting a washout the night before and day of the race. With wet weather seeming imminent, I was set to sleep in my car rather than dealing with getting soggy the night before the race in my water “resistant” tent. I ended up sharing a campsite with a buddy that was planning to sleep in his car as well, but didn’t have a campsite lined up. We caught up a bit that evening and talked race strategies before retiring pretty early to get a good night’s rest before the 5 AM start to a long day on the trails. see boulders like this on course. Thankfully, the forecasts for a rainy day were wrong and we were blessed with some near perfect running weather at the start of the race and for the entirety of the day. After a pre race speech we were off and running promptly at 5 AM. I felt good and my breathing was relaxed unlike last year when my breathing felt shallow and labored, I think mostly just due to nerves, for the first 10 miles or so. After the short stretch of road right at the start, we hit the technical trails that were heavily strewn with slick, wet rocks and roots. Even with the treacherous footing, I was more confident and felt more in control this year compared to last year. I believe there are two major reasons for this improvement: firstly, I was committed to starting with a more conservative effort this year rather than last year when I went out hard from the start and tried to maintain for as long as possible (that turned out to be a bit of a failure); secondly, the runners around me this year seemed far more calm and controlled than the runner I was directly behind during this initial stretch of trail last year. I’m not trying to criticize anyone’s technique or running style, but this guy I ran behind at the start of the race last year was slipping and nearly spilling every few steps the entire time I was behind him. I was honestly worried for his safety the entire time I followed him. I was nervous to start, and witnessing this made me even more nervous. Thankfully, this year everyone around me was as or more sure footed than me and going out at a pace that allowed for comfortable conversations. There are two pretty solid climbs between the start and the first aid station (High Rock) at mile 4.3. I didn’t want to lose much time at aid stations so went through pretty quickly, eating a gel and shoving one in a pocket of my hydration pack to eat on the trail. 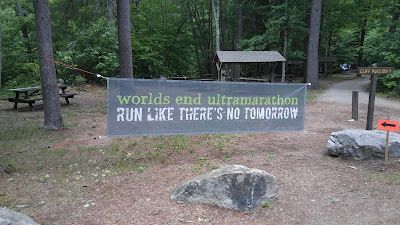 This was my basic nutrition plan for the day: a gel at and between every aid station. Additionally, I planned to start eating some real food around the halfway point, basically whatever looked or sounded good to me at that point. The next six miles to aid station 2 (Sones Pond) are more runnable than the first section with only one steep but not too long of a climb. I ran these six miles at just slightly faster than what I like to call my “forever pace”, basically a pace you feel you could maintain indefinitely without rest. After a quick chat with a runner (shout out Christian) I had met on a long training run earlier in the year, I continued my nutrition plan and ran the next 5.6 miles to AS 3, Devils Garden. This stretch is basically a medium distance descent followed by a medium climb. It was during this stretch that I caught up to and ran with another running buddy (shout out Steve) who was running the race while still recovering from a bit of an injury. Additionally, and for reasons I don’t understand, he was also running the first half without carrying any hydration of any sort. 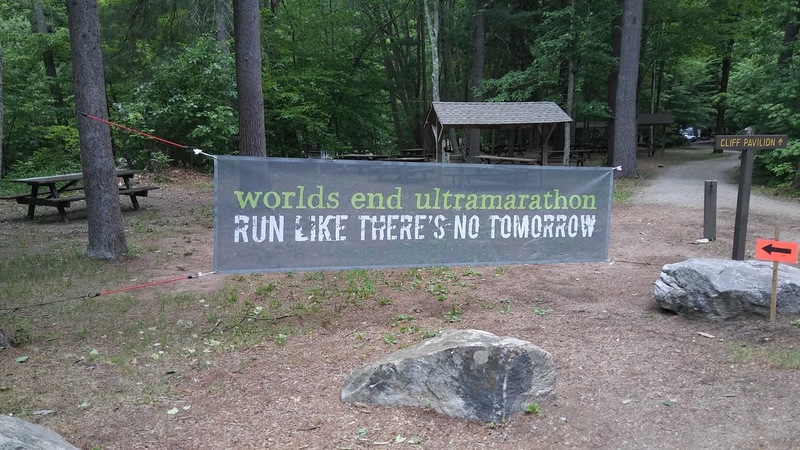 I get it that all ultrarunners are probably a bit of masochists to some degree, but this just seemed to me to be a bit ridiculous. In his defense, he intended to drop before the halfway point. After chatting for a bit, there was no doubt in my mind that he was not going to finish the race. To my surprise and amazement, he got his water bottle from his drop bag at the halfway point and finished the full 100k. So nothing but respect to you sir! I ran the short 3.4 mile stretch between AS 3 to AS 4 (Worlds End) at what still felt a comfortable and sustainable pace. I started drinking some soda (Mountain Dew or Coke) at aid station stops at this point for some additional calories. From last year I recalled the next 2.9 miles to AS 5 (Canyon Vista) as being some long, slow miles tackling some big climbs. While this section is mostly climbing with very little of it being flat or runnable, I felt much stronger taking it on this year and actually covered the distance more quickly than last year. Last year I was already beginning to feel exhausted at this point, so much so that my awareness of my surroundings was diminished to the point that I didn’t even notice the beautiful vista from the Canyon Vista AS. Not so this year. I took in the view and realized how much better I was feeling this year in comparison to last year’s race. I didn’t plan it, but that would then become my mantra for the remainder of the day: “Remember how you felt last year at this point? This year is so much better!”. The view from Canyon Vista. The next 5.5 miles to AS 6 Coal Mine are a bit more runnable made up of shorter climbs and descents. I started to let the reigns on my pace go a bit as I was still feeling kinda fresh given I was a third of the way done. Even so, my splits were still a mix of faster and slower than last year’s. All the while I was doing trail math to see if I was on pace to finish faster than last year. I didn’t completely trust my math, but I kept on calculating a faster finish time if I just maintained what so far had felt like a very manageable pace. I passed through Coal Mine, which I would argue may be the most festive and high energy aid station on the course (they also most strongly encourage the consumption of alcohol) and started in on the 8.1 mile stretch to High Knob taking two gels with me for the longer stretch. This section is made up of a medium descent and two respectable climbs. 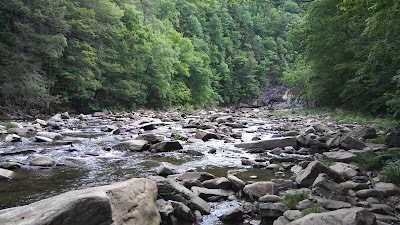 My feet were beginning to feel sore from having been wet for most of the first half of the race from soggy trail sections and small creek crossings. A big change I made this year was that I had A+D ointment, fresh socks, and dry shoes waiting for me at High Knob. 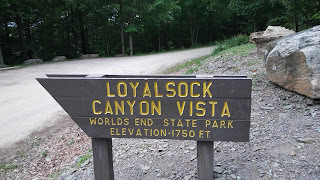 With the excitement of hitting the halfway point and the refreshments in my drop bag pushing me on, I managed the climbs to High Knob without much trouble. I took some extra time at the AS to cover my feet and any chafed areas with A+D, change my shoes and socks, and eat a couple perogies. It was a smart decision because afterwards my feet felt amazing and pain free. 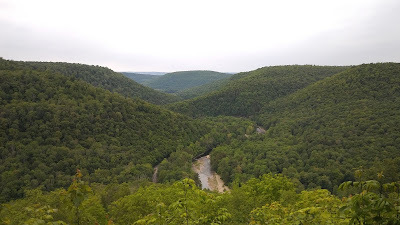 There is about a two mile stretch of runnable downhill leaving High Knob where I decided I was going to start pushing my pace a bit and cranked out my fastest miles of the day. It was also at this point that I realized my stomach was starting to revolt against all the gels I had been forcing down. Between the gel and Tailwind concoction sloshing around in my belly and the extra bouncing around running the downhill a bit faster, my stomach unexpectedly said “no thanks” and I ended up with a surprising mouthful of vomit. I managed to chew it back and force those hard earned calories back into my stomach to finish digesting. After the descent there is a big climb before completing the 5.8 mile stretch to Dry Run (AS 8). How could I have missed the Vista in 2017? It was around this point that the race started getting really interesting for me. 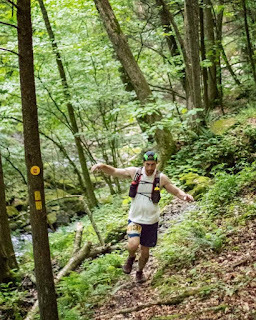 During my stop at High Knob, I was updated by a friend of another running buddy that my running buddy (shout out to Nate) who I hadn’t seen since the start of the race was only about 20 minutes ahead of me and looked really strong. With that update, I didn’t think I would see him until the finish. But then I thought about it some more. I was feeling really good after the halfway point. Twenty minutes on this course could be only a one mile distance of a long tough climb. Also, he went out hard from the start like I did last year. If that fast pace is going to catch up to him, it would likely be happening soon as it did me last year around this point of the race. All of this gave me hope that I may see him again before the finish, so I pushed myself on trying to up my pace a bit (we have a bit of a friendly competitive thing going on). After Dry run it is 3.8 miles to McCarty (AS 9), a water only aid station. From there it is a medium climb and descent to cover the 4.6 miles to Brunnerdale (AS 10). It was somewhere during that climb that I caught up to my buddy. I was a bit surprised to see him and I’m not sure if I surprised him, but he seemed a bit spent at that point. I finished the climb with him and ran some of the downhill with him before wishing him well and picking up the pace a bit to reach the next aid station, Brunnerdale. I was getting a bit hungry at this point and tired of the taste of gels. I took a little extra time to eat some real food, mostly pickles and grilled cheeses. While refueling, my buddy rolled into the aid station and joined all the volunteers there in encouraging me to do a few shots of the Fireball they were offering (like I said, we’re a bit competitive with one another). I regretfully declined and headed out from the aid station just before my friend. It would be a climb, descent, and climb to cover the 4.9 miles to the next water only aid station, The Gate (AS 11). From there it’s another three miles of smaller hills to Fern Rock (AS 12), the final aid station. I focused mostly only on moving forward as quickly as possible to avoid getting caught by my friend, but looked back a few times during this stretch and saw no sign of him. I ate a few Tums to settle my stomach which was feeling a bit queasy then left spending little time at the final aid station to hurry on and finish the last 5.9 miles of the race. To my surprise and distress, within seconds of leaving the aid station I heard a loud cheer from the volunteers there. Without a doubt, another runner was coming in just as I left. I couldn’t be sure, but I figured it was probably my buddy trying to close on me during the home stretch. 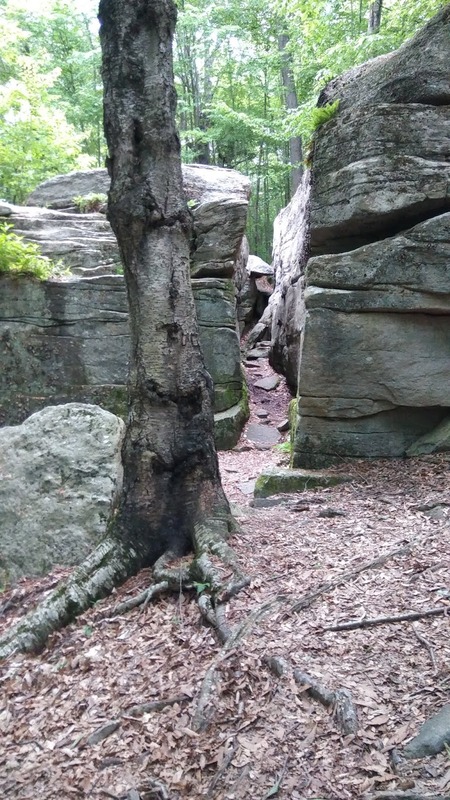 Most of the last section is pretty nontechnical and runnable without any big climbs. I had hoped that this would be the part of my day where I just comfortably cruised in for the finish. Given the situation though, I was running this section scared, checking over my shoulder a few times every mile. There’s one stretch (maybe about a half mile) of straight paved road in this section. With my friend having been a damn fine road marathoner, I knew that would be his prime opportunity to close on me, but there was no sign of him as I anxiously looked back. Suddenly, with about two miles to go I was no longer worried about being chased. I caught sight of two runners about a quarter mile ahead of me. All of my focus and effort went to chasing rather than being chased. Shortly after I saw them they saw me and started to book it. The chase was on. I lost sight of them as they hopped onto the final single track that takes you down a gnarly and steep descent before dropping you out into the parking area of the start/finish area. 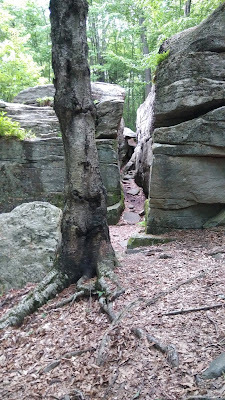 I saw them again and they seemed within reach on this technical descent, but they disappeared again as the trail ended at the parking area. When I reached that point I saw them sprinting around the parking area towards the finish and I gave it my all to catch them, but they still had enough in their legs to maintain a gap. I finished about 30 seconds back with a story of what was the most exciting and probably the tightest finish I had ever experienced in any ultra I’ve ever run. And with that intense last six miles of being chased and chasing over, it was time to celebrate with friends, food, and some IPAs from New Trail Brewing Company. My buddy came in just about 10 minutes behind me and let me know that it was in fact him that came into the final aid station just as I was leaving. The finish line food was just as amazing as last year and this year my stomach was able to handle it a bit better. After a couple hours of food, drinks, telling stories of our days and listening to everyone’s adventures, the exhaustion began to set in and I decided it was time to get clean and crash in my sleeping bag. The start/finish area, very empty (also very clean) the day after. I went into this race with a better plan than last year and a better mindset. Ultimately it paid off and I finished 34 minutes and 39 seconds faster than last year, making up the five minutes and far more that I was off at the finish of the Hyner. Knowing this made the finish so much more valuable. 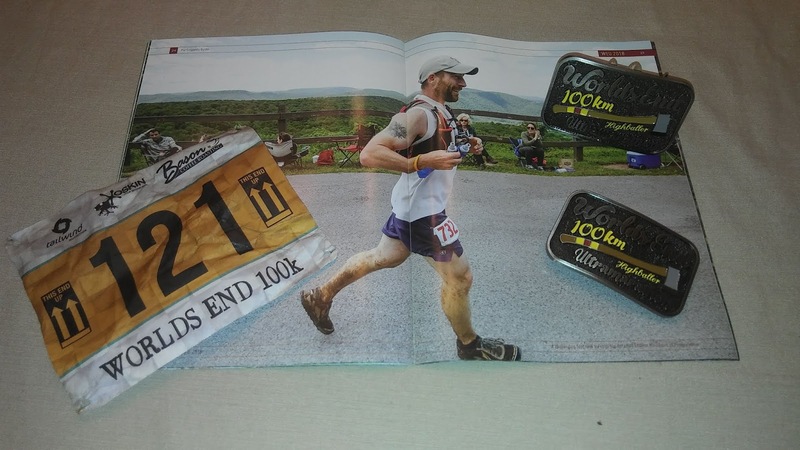 I finally felt like I was beginning to figure out a few more key elements of this whole ultrarunning thing after hammering away at it for a few years. It felt like real progress towards improvement. Later, this feeling was reinforced when I compared my Garmin data from last year’s Worlds End to this year (Chart 1 and Table 1). Both tell the same story of my day and tell me that my strategy of going out easy (2018) made for a much better overall performance than going out too hard (2017) and trying to maintain. It reinforced my interpretation of my 2017 performance that I basically bonked and blew up around mile 40. What is truly intriguing to me is that it wasn’t until after mile 50 that I actually would have passed myself running my 2017 race and I was able to gain over a half hour on my time in the last 10 miles. It really drove home the lesson for me about how devastating blow ups and bonks are. However, in contrast, if you never blow up or push to that level you may always wonder what more was possible. Regardless, I wasn’t asking that at this finish. I was too happy with having a plan that worked and executing well. Line graph of 2017 and 2018 Worlds End 100k Garmin splits data. Garmin split data comparing 2017 to 2018 Worlds End 100k.